Springfield, Illinois as everyone knows if filled to the brim with history of our nation’s 16th president. Downtown not far from the Abraham Presidential Library and Museum and south of Lincoln’s tomb and east of the home sits the office where he practiced law for about ten years. Seth Tinsley built a commercial building in the Greek Revival Architectural style around 1841 and Lincoln and his second law partner Stephen Logan moved in on the third floor above a federal courtroom. On the first floor was a post office. Located across from the then State Capitol, the location was supreme. I enjoyed walking through the rooms and was surprised by the simplicity of the furnishings and cramped quarters that Lincoln worked his magic in. The tour guide shared stories of Lincoln’s children coming to work with him and running rampart through the rooms. It brings a smile to think of him in a less serious way and see that being a father was foremost in his mind. With many sites to choose from, the law office is I think often overlooked, but this tour fills in the missing pieces between the New Salem and presidential days. While serving as a US Congressman, his partner William H. Herndon (1818-1891) maintained the practice. 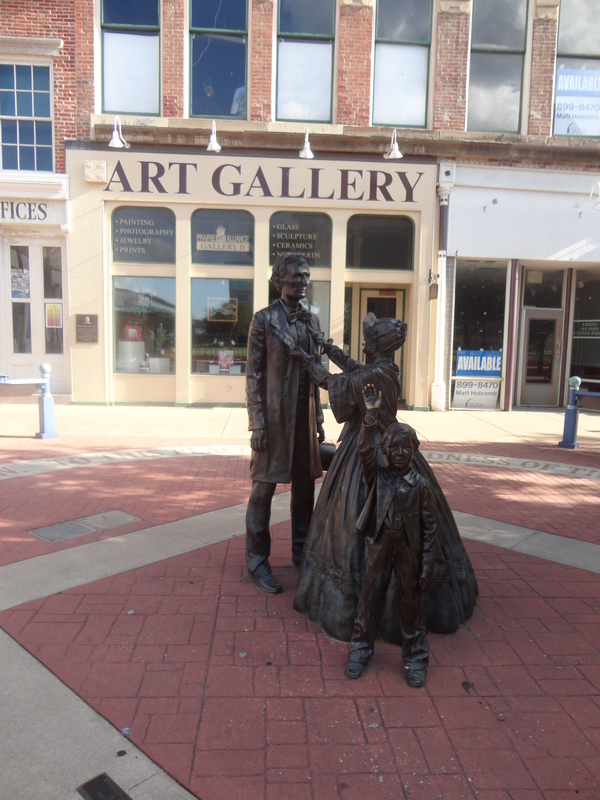 Any Lincoln history buff will enjoy the office tour. I also love this statue in the photo that sits to the side of the office building. The Lincoln-Herndon Law Offices State Historic Site is open daily from 9:00 a.m. to 5:00 p.m. from May through Labor Day. After Labor Day to May it is open Tuesday through Saturday from 9:00 a.m. to 5:00 p.m. The last tour begins 45 minutes before closing. The site is closed major holidays and is handicapped accessible. Donation suggested. The site phone number is 217/785-7289. Groups of 20 or more should make reservations. Call the Springfield Convention and Visitors Bureau at 1-800-545-7300 or 217/789-2360. Totally off track, but if in Springfield during the week and day time hours take a minute to try the soup and sandwiches offered at the Feed store. The mushroom bisque and chicken salad are my own personal favorites!